Many thanks for the invitation. Nevertheless, I am not sure I am the right person to speak at the panel called “Geopolitical challenges”. I know and I do not hesitate to admit openly that my comparative advantage isn´t in the field of geopolitics. This is, in my view, a field without a coherent theoretical structure, without well-defined hypotheses, which makes it difficult to say anything meaningful, strong and resolute. My main topic these days is Europe, perhaps the future of Europe, or better to say the future of us, Europeans. It is also a topic without any theoretical underpinning, but it is, at least, interesting and relevant. It is a part of our life. It is not just a topic of our doctoral disertations. Something has changed in international politics recently. I feel it very strongly. This is my third trip to Budapest in the last four months. This frequency is unusual. It used to be, in the last thirty years, in the whole era after the fall of communism, three trips in a decade. Why is it so different now? I don´t think the reason can be found in geopolitics, even though there has been important developments there. Something has happened here, here in Europe, here in Central Europe, here in our societies. As I see it, the main issue has to do with the fact that one medium-sized country ceased to be a passive object of geopolitics, and of the games which the Euroelites try to play with us. This country started to behave actively. This country is Hungary. To my great regret only Hungary. 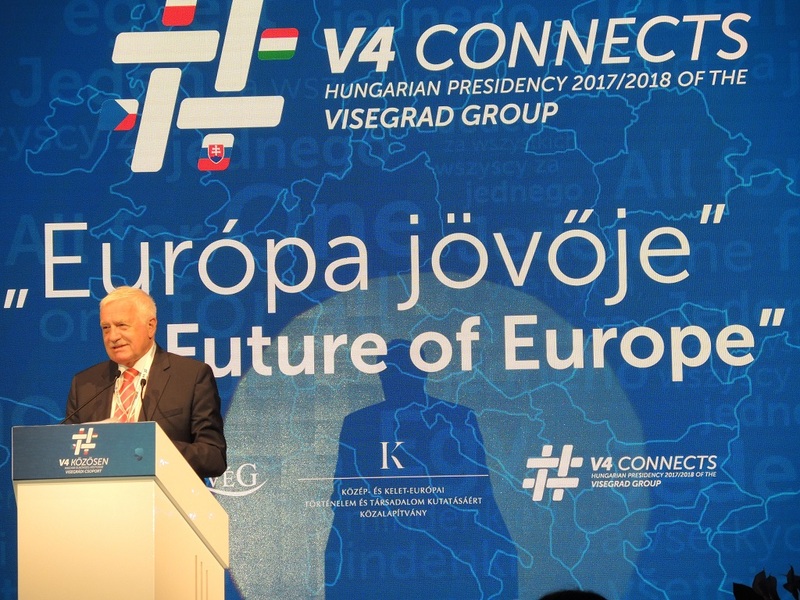 In the preparatory documents of our today´s conference, the organizers write that the Visegrad Four countries, I quote, “are seeking new answers to the challenges” of our era. This is a very friendly, polite but undeserved statement. I am not sure it is true. I regret being forced to say that my own country, the Czech Republic, is “not seeking” anything these days. We have neither a government, nor a political leadership. Some of the Czechs, perhaps, individually, try to do something. They seek to keep the very weakened and heavily endangered identity of the Czech state in the nation-states liquidating European Union alive but there is no government policy in this respect – neither explicit, nor implicit. I don´t have any mandate to speak on behalf of Slovakia but it seems to me that the situation there is very similar. Especially after the fall of Prime Minister Fico, after the recent events there, which reminded us of a sort of from above organized coup. Poland deserves attention because it is an entity with a specific way of looking at the world and with specific policies in some fields which is very refreshing for all of us. To my great regret, I find, however, some Polish stances rather ambivalent in their geopolitical ambitions and consequences. Summing up, I do not see the Visegrad Four countries to have enough courage, enough strength and enough determination to pursue a common, independent policy. It may have looked like a policy in the autumn of 2015, but I hadn´t seen it before and I don´t see it now. When we discuss the V4, we usually rightly mention our similar, four decades long, experience with communism and with the Soviet imperial dominance. On the other hand, we – politely and incorrectly – underplay the historical difficulties this region used to have with Germany, which is something I consider a conceptual mistake due to a lack of firmness and resolution. We sometimes stress the threatening experience of these countries with the Ottoman invasion into their territories several hundred years ago but we don´t often explicitly speak about our common experience with the Austro-Hungarian Empire. All that should be taken into consideration. The Visegrad Four countries undoubtedly represent a special case in contemporary Europe. This is true, but is the V4 a real player in international politics? As an economist – and the economic science deals with the behaviour of economic subjects or agents (economics is not about tons of coal, barrels of oil or the production of rice) – I am always, almost subconsciously, searching for subjects, agents, players, because only they can have a behaviour, only they can have an intentional and deliberate policy. That´s my problem with geopolitics in general (and with Europe and V4 in it). Is Europe (and similarly the V4) a player in international politics? I don´t think so. Europe is a continent, a civilizational and cultural entity, not a political one. The V4 even less so. If not Europe, is at least the European Union a geopolitical player? Its leading political elites undoubtedly want the EU to play a prominent role in today's world, but is it really so? And do we want it? The almost half a century old Henry Kissinger´s point when he asked about the European telephone number is still relevant. As I see it, the EU wants to be a geopolitical player but it is not. I have in mind a real player, not a nominal one. In addition to it, all of us who live in Europe (I only with an evident hesitation speak about us as of Europeans) should explicitly raise the question whether the trio Merkel-Macron-Juncker should be allowed to speak in our name, on our behalf. My answer to this question is "no", especially after the recent gesture of Mr. Juncker in Trier where he more or less legitimized the legacy of Karl Marx. A continent doesn´t speak. Only people do. My point of departure is that something has changed in the first three decades of the 21st century. To say three decades is not a numerical error. I deliberately use number three. Many authors consider the 19th century to last till 1914. It seems to me that we can similarly say that the 20th century lasted only till 1989. We are, therefore, at the end of the third decade. - It is difficult to say anything new or interesting about Europe. Everyone knows that the European integration project is in a crisis. It is hard to deny it. It is also evident that the artificial unification of Europe – the current ambition of the European political and intellectual elites – is not feasible. The people want to be free, not united. The available alternatives are not very promising. The Brexit killed the dreams of the all-European future of the EU. The French-German project of Europe has no chance to be realized, because one partner is too weak to be real a partner. What remains is the German EU project as a way to legitimize the German hegemony (this time achieved without a war), but this is not what the countries like Hungary or the Czech Republic are interested in. - the man – by trying to bring into existence a new European man, homo bruxellarum, by artificially mixing citizens of European countries and – because it was not proved to be sufficient – by promoting and organizing the mass migration of individuals without European roots into Europe. One of my conclusions, therefore, is that Europe, represented by the EU, cannot play a significant role in the contemporary conflicts and disputes among the key world players. Another dimension of the current geopolitical uncertainties and tensions is the West vs. the Rest issue. The Western hegemony is evidently over, the Fukuyama´s paradigm (even though he originally formulated it slightly differently, more cautiously) that the world has just one, “Western” future proved to be wrong. We should accept it and come to terms with it. Not keep denying it. Some Western public intellectuals try to continue promoting it as if its all original assumptions are still valid. They are not. This paradigm is definitely over. One of the main problems of our era is, in my view, the propaganda and the promotion of the ideology of universalism. The dispute we are confronted with is between those who accept the universalistic interpretation of the world and take it as a normative goal we all should strive to realize and those who reject it, who see and respect the differences which characterize mankind, who don´t want to make all of us uniform, who don´t want to bring us all into a line drawn by quasi-progressive and would-be enlightened Western public intellectuals and their fellow-travellers in politics on one side and by obscurantist, pre-modern oriental traditionalists on the other. This is a caricature of the world reality. The universalists deny the existence of any meaningful differences between the West and the Rest. There exists – according to them – just one world community, one universal parenthood, one unstructured bundle of individuals belonging to the Homo sapiens family. This may be valid at the biological level, but not at any other, especially not at civilizational, cultural or religious levels. I agree with Huntington´s view that “the people of different civilizations have different views on the relations between God and man, the individual and the group, the citizen and the state, parents and children, husband and wife, as well as differing views of the relative importance of rights and responsibilities, liberty and authority, equality and hierarchy. These differences are the product of centuries. They will not soon disappear.” They can´t be and – especially – shouldn´t be artificially and violently eliminated. The West is in a crisis and there are no indications it is going to end any time soon, whereas the Rest goes ahead much faster than we used to think and are ready to accept. We still continue to speak about the permanent wars and the lack of humanity there, about intractable political instability, about economic underdevelopment and hunger, about droughts and global warming, etc., but this is a misleading picture. Even worse, this is an intentionally misleading picture. We witness an enormous and undeniable economic development not just in the well-known East-Asia tigers or in the oil-rich countries. Almost unnoticed came the news about the last electrified village in India a few days ago. This is a great achievement. Even Africa is visibly moving ahead. It suggests that the mass migration does not need to be the overall feature of the future world – on condition Europe stops its destructive policies. The Arab world seems to be in disarray but the West should not underestimate its own role in giving rise to it. Especially at the end of colonialism hundred years ago and again quite recently by Western absurd support (if not initiation) of Arab coloured revolutions. We shouldn´t pretend to be “uninvolved observers”. - even though the V4 nominally originated more than 25 years ago, has it become a real political player? Not nominally, but really? - Is the V4 sufficiently homogeneous in its interests? - Is the V4 able to put through its own independent policies in the post-Lisbon EU? - Is the V4 project an authentic answer to the ongoing European problems and to the attempts to further de-democratize the European continent? My answer is a negative one. But – as I said at the beginning – I am only an amateur in geopolitical topics. I am afraid my speech demonstrated it sufficiently. 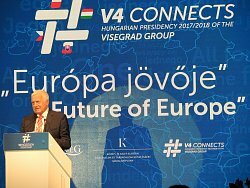 Václav Klaus, Speech at the conference The Future of Europe, Public Foundation for Research on Central and Eastern European History and Society, Castle Garden Bazaar, Budapest, May 24, 2018. See my speech „Sollte Karl Marx zweihundert Jahre nach seinem Geburtstag ein neues kolossales Denkmal in Trier bekommen?“ (in German), AfD Veranstaltung, Best Western Hotel Trier City, Trier, Germany, May 4, 2018. You can also find it here: www.klaus.cz/clanky/4265 and in Weltwoche No. 19, 2018. See Klaus, V., Weigl, J., Europe all inclusive, Václav Klaus Institute, publication No. 34/2017, Prague, 2017. The book has also a Hungarian version “Népvándorlás. Útmutató a jelenlegi migrációs válság megértéséhez”, Századvég Kiadó, Budapest, 2018.